RIO GRANDE VALLEY, TEXAS – May 11, 2018 – UTRGV campuses support what the Department of State Health Services calls a Mother-Friendly Worksite by providing nursing mother suites, which allow working staff, faculty or student moms designated rooms to breastfeed or pump breast milk. “The nursing mother suites are a part of UTRGV’s commitment to support working or student moms and one of their needs is for them to be able to take care of their kids,” said Carla Lopez, wellness coordinator in the university’s Human Resources department. To have access to a designated room, mothers can register with HR, who will then issue them an electronic “Mommy Card” for access. The form for registration can be found on the university website here, along with more information on the suites and health policies. 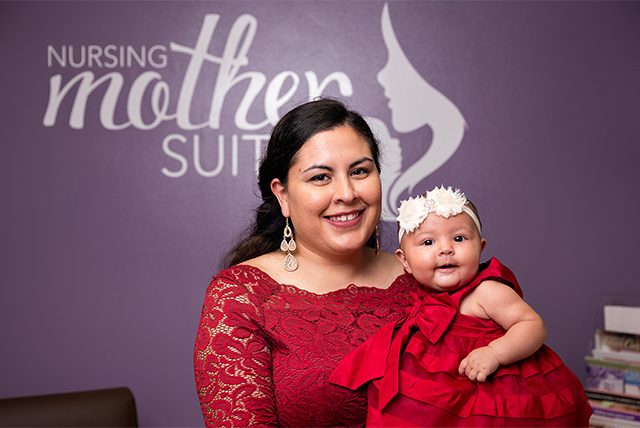 Scattered throughout the Brownsville, Harlingen and Edinburg campuses, the nursing mother suites provide all the essentials a nursing mother might need, such as a sink to clean the pump or bottle parts, a changing table, and a quiet, discreet place. Leal said being able to pump onsite at the Edinburg Campus eases her stress and helps her bonding process with her 5-month-old daughter, Mia. It also has benefits for the baby. For Katherine Christofferson, assistant professor of Applied Linguistics, starting a new job as a breastfeeding mother was a bit stressful until she discovered how supportive the university was.